Department of Otolaryngology and Head & Neck Surgery, Postgraduate Institute of Medical Education and Research, Chandigarh-160012, India. *Address correspondence and reprints request to: Roshan Kumar Verma, Department of Otolaryngology and Head & Neck Surgery, Postgraduate Institute of Medical Education and Research, Chandigarh-160012, India. Verma RK, Kaushal D, Panda NK. 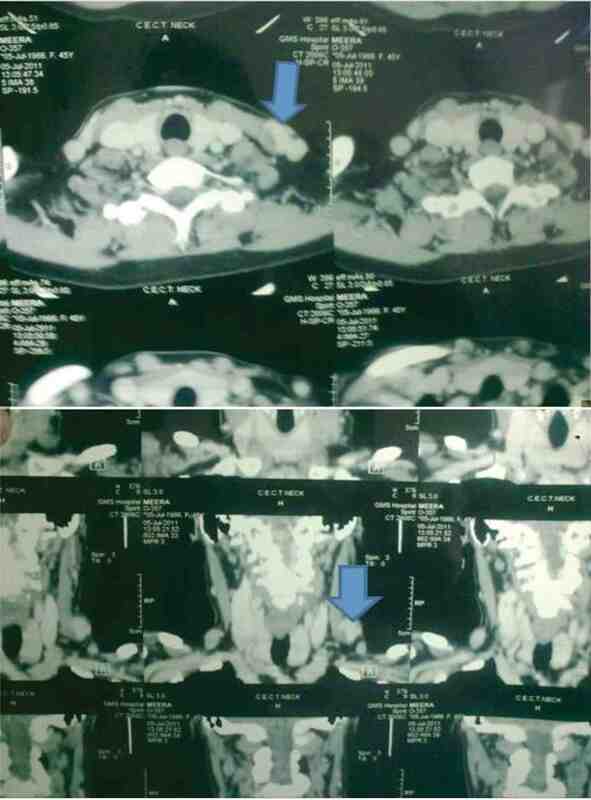 External Jugular Vein Aneurysm with Thrombus Presenting as Painful Neck Mass: A Case Report. Oman Med J 2013 Jul; 28(4):278-280. External jugular vein aneurysm with thrombosis presenting as neck swelling is a rare clinical entity and rarely encountered in routine clinical practice. We present a case of a 45-year-old female with external jugular vein aneurysm presenting as a painful lump in the neck. Ultrasound of the neck and CT angiography showed saccular dilation of the lower end of the external jugular vein with thrombosis within the aneurysm. Saccular aneurysm of the external jugular vein is very uncommon and can lead to thrombotic complications with serious consequence. Keywords: Saccular aneurysm; External jugular vein; Thrombosis; Painful neck lump. Venous aneurysms of the neck are rare clinical entities. Venous aneurysm of the neck commonly involves the internal jugular vein.1 Venous aneurysm of external jugular vein is very rare and very few cases have been reported in the English literature.2-7 Aneurysmal dilatations of the cervical venous system are rare due to the low pressure in the vena cava.8 Common etiologic factors are tumor, thoracic outlet syndrome and trauma.6 Inflammation, degeneration, and increased pressure within the venous system could also be possible causes of venous aneurysm in the neck.5 Venous aneurysms in the neck usually have a benign clinical course and may present as cervical swelling, pain and tenderness in the neck. In this report, we describe a 45-year-old female with aneurysm of the external jugular vein and its clinical and radiological characteristics. A 45-year-old woman presented at our outpatient department with complaints of progressive swelling on left supraclavicular region for 3 months. The swelling had increased in size during the last 15 days with accompanying pain and feeling of tightness over the left side of the neck. There was no history of preceding trauma, and there was no history of difficulty in swallowing, change in voice or any nasal symptoms. Furthermore, there was no history of prior hospital admission. Figure 1: A 45-year-old female with lump in left supraclavicular region for three months. The patient was reassured and asked to come for regular followup. She returned after a week with complaints of increasing pain over the swelling. A decision to excise the swelling was made. Under general anesthesia, adhesion to the surrounding tissues was freed and the mass was excised after ligating the proximal and distal ends of the external jugular vein, (Fig. 4). Postoperative period was uneventful. Figure 2: USG of neck showing aneurysmal dilation of external jugular vein. Figure 3: CT scan of the neck showing aneurysmal dilation of external jugular vein (arrow) with areas of calcification within the mass. Figure 4: Resection of aneurysm with the excised mass. Histopathology of the excised mass showed a grossly dilated vein, 3 × 2 × 1 cm globular shape, and the presence of a thrombus inside the dilated vein. Microscopically, it showed a dilated intact venous wall with marked reduction of smooth muscle cells in the media. A diagnosis of venous aneurysm was made. Venous aneurysm was first described in the literature by Harris in 1928.9 Hischler suggested the term venous aneurysm similar to arterial aneurysm.10 True venous aneurysms are rarely encountered compared to arterial aneurysm, as well as can affect any veins including intracranial, cervical, thoracic, visceral, and upper and lower extremity veins; however, venous aneurysms of the neck are rare due to low pressure in the vena cava system.7 In the neck, the internal jugular vein is the most common vein involved.1 Aneurysm of the external jugular vein is rare and very few cases have been reported in the literature to date. Patients with external jugular venous aneurysm usually present with a soft, nontender, nonpulsatile, saccular or fusiform swelling in the neck, which increases in size on crying, straining, or when performing a Valsalva maneuvre. Few patients may complain of constricting sensation, choking, discoloration or discomfort in the neck. Differential diagnosis for such lesion includes lymph node, laryngocele,13 thyroid lesion, lipoma, thyroglossal cysts, branchial cyst, cavernous hemangioma, pharyngeal pouch and arterial aneurysm. Jugular venous aneurysm may lead to thrombus formation due to stagnant and low pressure flow within the neck veins. There is also the risk of rupture of aneurysm by trauma to the neck, though arterial aneurysms are more prone to rupture.17 Surgical excision is the treatment of choice in the management of venous aneurysm of the neck for the fear of risk of thrombosis, possible fear of rupture, and for cosmetic and esthetical reasons.6,17 In our patient, surgery was performed due to an increased in size and increasing pain over the swelling which was suggestive of thrombus formation within the EJV aneurysm. External jugular venous aneurysm is a very rare clinical entity. Most neck venous aneurysm are congenital in origin. Acquired causes include trauma, tumor, thoracic outlet syndrome, and iatrogenic causes. USG Doppler ultrasound and CT angiography with DSA are the gold standard for the diagnosis of venous aneurysm of the neck. Prophylactic surgery is the treatment of choice for fear of thrombosis and rupture of the aneurysm. The author reported no conflict of interest and no funding was received for this work. 1. Lee HY, Yoo SM, Song IS, Yu H, Lee JB. Sonographic diagnosis of a saccular aneurysm of the internal jugular vein. J Clin Ultrasound 2007 Feb;35(2):94-96. 2. Rawat NS, Gupta A, Khurana P, Jain S, Trehan N. MSCT angiography diagnosis of thrombosis in external jugular venous aneurysm: case report and review of literature. Indian Heart J 2008 Jan-Feb;60(1):52-54. 3. Verbeeck N, Hammer F, Goffette P, Mathurin P. Saccular aneurysm of the external jugular vein, an unusual cause of neck swelling. J Belge Radiol 1997 Apr;80(2):63-64. 4. 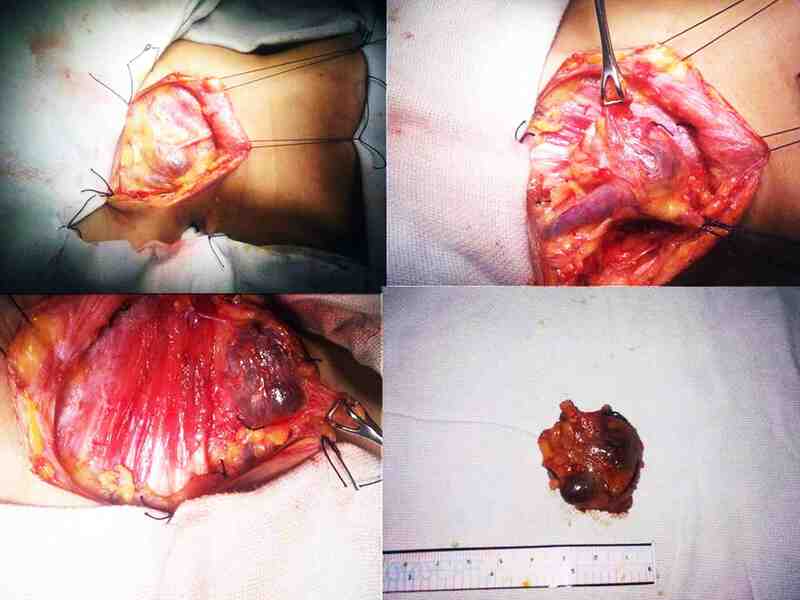 Kaygin MA, Erkut B, Ceviz M. External jugular vein aneurysm: a rare cause of neck swelling. Ann Saudi Med 2008 Jan-Feb;28(1):62. 5. Al-Shaikhi A, Kay S, Laberge JM. 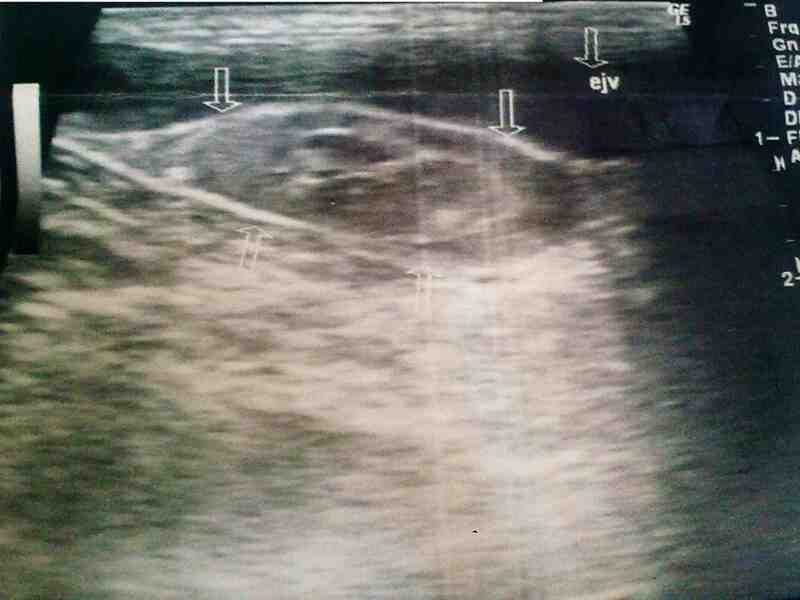 External jugular venous aneurysm: an unusual cause of a neck mass in a young child. J Pediatr Surg 2003 Oct;38(10):1557-1559. 6. Ioannou CV, Kostas T, Tsetis D, Georgakarakos E, Gionis M, Katsamouris AN. External jugular vein aneurysm: a source of thrombotic complications. Int Angiol 2010 Jun;29(3):284-285. 7. Drakonaki EE, Symvoulakis EK, Fachouridi A, Kounalakis D, Tsafantakis E. External jugular vein aneurysm presenting as a cervical mass. Int J Otolaryngol 2011;2011:485293. Published online 16 May 2011. 8. Regina G, Cardia G, Squeo MA, Lillo A, Latorre M, Odero A. Aneurysm of the Internal Jugular Vein A Case Report. Vasc Endovascular Surg 1988;22:169-171 . 9. Harris RI. Congenital venous cyst of mediastinum. Ann Surg 1928;88:953-956. 10. Hilscher WM. Zur frage der venosen aneurysmen. Fortscher Röntgenstr. 1995;82:2444-2447. 11. Schatz IJ, Fine G. Venous aneurysms. N Engl J Med 1962 Jun;266:1310-1312. 12. Azghari A, Belmir H, Kharroubi A, El Khaloufi S, El Idrissi R, Lekehal B, et al. External jugular vein aneurysm: a rare cause of neck swelling. A report of three patients. J Mal Vasc 2011 Dec;36(6):395-398. 13. George BR, et al. A rare case of laryngocele in Omani male. OMJ 2010;25(2):157-159. 14. Zorn WG, Zorn TT, Van Bellen B. Aneurysm of the anterior jugular vein. J Cardiovasc Surg (Torino) 1981 Nov-Dec;22(6):546-549. 15. Ekim H, Özen S. Primary venous aneurysm of the external jugular vein. EJM 2002;7:24-25. 16. Ashu seith Bhalla, Pankaj gupta, Amar Mukund, Arvind Kumar, Mudit Gupta. Anamolous systemic artery to normal lung- A rare cause of hemoptysis in adults. OMJ 2012;27(4):319-322 . 17. Fishman G, DeRowe A, Singhal V. Congenital internal and external jugular venous aneurysms in a child. Br J Plast Surg 2004 Mar;57(2):165-167.